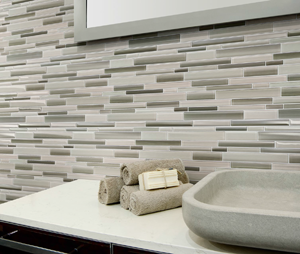 Designed to be a one-stop solution to coordinate with the entire breadth of Florida Tile’s porcelain and stone product lines, VitraArt Fusion features 8 colors in a 12x12 random size pattern. The palette is a unique blend of tone-on-tone contrasts with slight shots of color, creating an exciting installation. Four neutral tones—Ice, Sand, Clay, Plantation—will subtly accent a more classic design space. Four slightly contrasting but complementary color combinations— Carbon, Oxide, Rock, Erosion—will create a bolder accent in contemporary or commercial design spaces. VitraArt Stained Glass offers a 7-color palette in three shapes—1x1 square, a 3-column random stack that incorporates multi-width 4” strips, and a thin linear random sized strip—all in a 12x12 mesh-mounted mosaic. This unique hand-cut style glass, thin yet durable, is an inspiration in artistic design that brings an air of luxury like a fine Tiffany lamp. 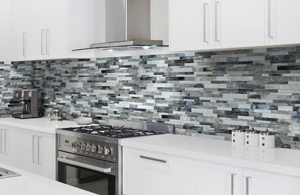 The layered glass style in a wide range of contemporary color blends will bring a stunning look to any project. For additional information on these lines, please follow the links to Florida Tile's website. All sizes noted here are in inches.